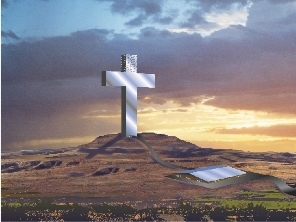 A 313 meter (1027 foot), mirror-finish stainless-steel Cross will be built at or near Mt. Jesus, in southwestern Kansas ranch country. It will be 50 meters (164 feet) wide, 30 meters (98 feet) deep. A root meaning of “America” is ever-powerful in battle. Cross means “an affliction that tries one’s patience”. This cross is a 21st century Cross for 21st century calamities (disastrous events marked by great loss) – a “message of hope” for those traumatized by events such as shootings, tornadoes, earthquakes, hurricanes, tsunamis, the 9/1 attacks and other troubles. A skyscraper Cross is something to relate to if interested in any form of spirituality. Two of the American Cross’ concepts are to save those who are traumatized from a private hell, and to save seven billion people from the possibility of an eternal hell. It is named “American” Cross for a number of reasons, including because it embodies America’s form of spirituality; as a renewing of an “American spirit”; and as a symbol of America as possibly being construed as “God’s Country”. The spirit of the God of the universe has power to heal, which the Cross does symbolize. The multi-million dollar project is being done by the American Cross Foundation, a Registered Delaware Corporation with a F.A.A. permit. The monument will have support cables from the end of each horizontal cross-member to the ground, similar to a television tower. If the Cross is free-standing, it could become more of a target for Nature and Man. Due to safety concerns, there will be nothing in the monument itself. Your generous donation is greatly appreciated in furthering the efforts of building a symbol of hope for not only Americans, but for others around the world.